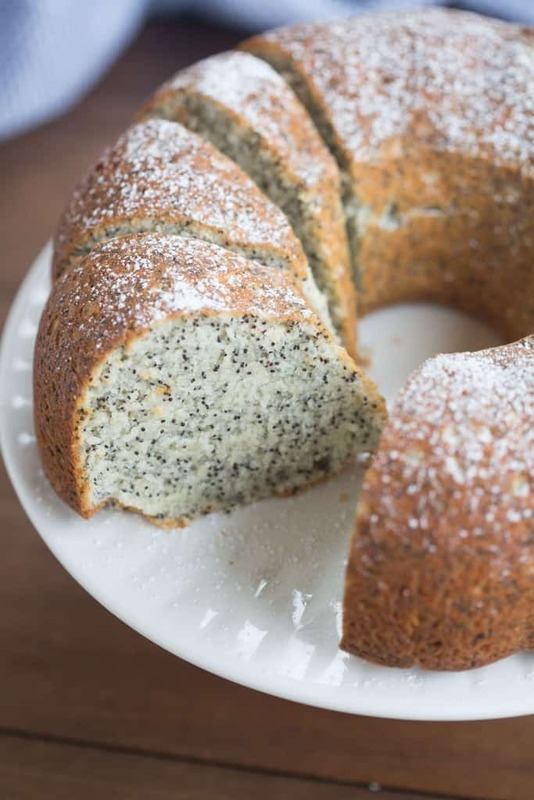 Incredibly light and tender homemade Poppy Seed Cake, perfect for brunch or dessert! 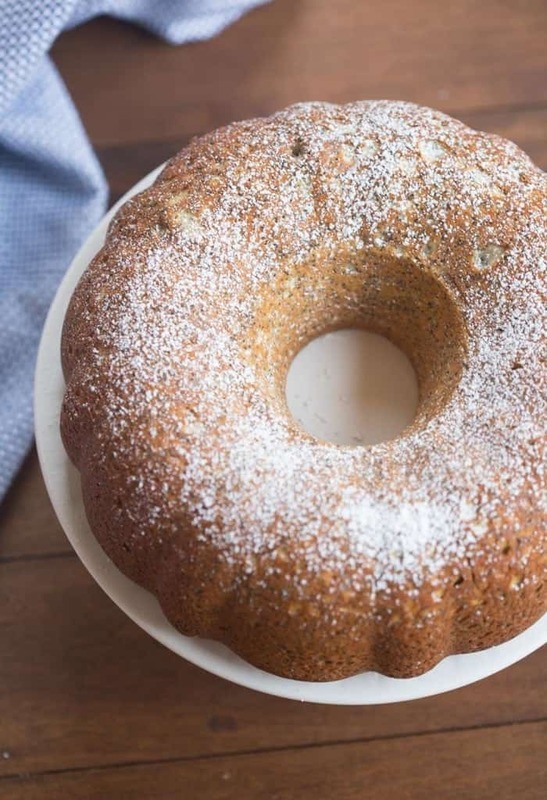 I’m a huge fan of simple, CLASSIC recipes, like this Poppy Seed Cake. The ingredients are simple and the presentation is simple. Sometimes it’s the simple sweets that are the most popular! 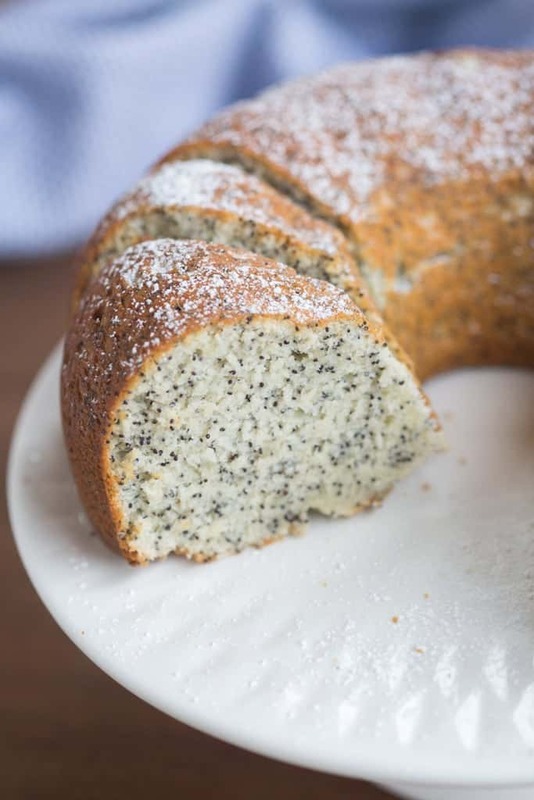 My mom has been making this poppy seed cake for years. The original recipe came from her friend (thanks Ciel!!) and it’s one our family has grown to treasure. 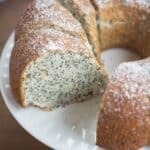 This poppy seed cake is NOT dense, rich or overly sweet, and that’s part of why I love it so much! It’s like a step-sibling to angel food cake in how light, and mildly sweet it is. I also think it’s beautiful in it’s simplicity. No frostings or glazes. Just a lightly dusting of powdered sugar. It’s the perfect cake for serving at brunch with fruit and something warm to drink. It could definitely be served as a light dessert as well–I’m thinking some sugared strawberries on top and maybe even a spoonful of fresh whipped cream would be divine. Sift together flour, salt, and baking powder. Stir in poppy seeds. Set aside. Cream together butter and 1 1/4 cups of the granulated sugar. Stir in 1/4 cup milk and vanilla. Alternately add the flour mixture and the 3/4 cup milk, a little bit at a time, stirring gently after each addition, starting and ending with flour. Beat the egg whites in a large bowl until they stand in soft peaks and then beat in remaining 1/2 cup sugar. Fold egg whites into cake batter. Pour batter into greased bundt pan. Bake for 35-40 minutes or until a toothpick inserted in the center comes out clean. Allow to cool for a few minutes in the bundt pan before inverting on a wire rack. Sift powdered sugar over the top of the cake before serving. There are some simple dishes, like all the other simple things in our lives, that are the best and last forever. Literary. So does the magnificent evergreen Poppy Seed Cake. Thank you so much for sharing this one with us ! The recipe calls for 1 cup if milk, divided, yet it says to add only 1/4 cup milk to the butter and sugar mixture. There is no indication for the other 3/4 cup milk so I just added it to the batter at the end, before the egg whites. ALSO, I greased and floured the bundt pan where you only say to grease it. I have had other cakes that I have not been able to remove from the (nonstick) bundt pan before. is it preferable to use grease and flour or was this an omission in the recipe? Hi Wendy, the remaining milk is added in step 5. I clarified the instructions to make it more clear! Hope you enjoyed the cake! I just reduced to only 1 cup of sugar. Great recipe and a big hit with the family. Thank you for the recipe. Look amazing! Can I switch the 4 egg white with 2 eggs? what do I missing by doing so? I wont use recipes which only use ”CUPS” as a measurement, If I am expected to change cups to Grams or ounces, I just ignore them. Have consideration for the Millions of people outside the USA who use real measurements. You have some good recipes, but I’m not going to spend hours converting your cups to Grams or Ounces. Hi Paul, that is definitely not lost on me. Time has not allowed me to get to that point yet, but hopefully one day. Really, Paul? You couldn’t have said that without haughtiness and arrogance? The girl is from America… those are the measurements they use. Almost every recipe I look up on the internet uses those measurements. It’s not that hard to convert. She was just sharing something she loves. Give her a break …and maybe an apology! I want to make sure the egg yolks are not used….is this correct? can this recipe be used in a loaf pan? Hi Joan- I have a similar lemon poppy seed bread that’s meant for a loaf pan! Enjoy! This looks amazing! What would be your suggestion if I wanted to add some lemon? I’m not a professional baker so any suggestions you have are appreciated. Thank you. You could easily incorporate lemon into this recipe. I would add about 2 teaspoons of lemon zest and stir it right into the batter! You could also make a lemon glaze to top the cake. Check out the orange glaze on this recipe and substitute lemon zest instead. You may also want to double the glaze recipe. My family always told me that this recipe, my great aunt Hedwig, won a Pillsbury bake off many years back. Interesting she had a cousin Ceal! Are you from Pittsburgh! This is a family favorite as well!